"Symbiosis International empowers Bangladesh’s poorest people to find sustainable solutions to poverty and disadvantage. We do this by creating self-help groups and by equipping group members with the tools and knowledge that they need to take control of their own future. A high priority is providing illiterate women with the opportunity to learn to read and write. In a context where girls have often been denied the chance to go to school, this is a life changing experience. As well as gaining an important skill, the content of the course teaches women about human rights and how to improve their health and nutrition. Group members also save money together and build up a fund that they can use to establish small business enterprises. This might be as simple as taking a loan to buy a sewing machine or a cow to raise, but the impact can have can be truly life changing. Since starting work in 1995, Symbiosis now has established 1000 self-help groups with nearly 20,000 members. These members have collectively saved and generated a staggering $1.4 million! Most of the members are women and most of these groups are able to manage their own activities – this is our definition of sustainable development! Whilst most of our work is focused on long-term development, sometimes disasters strikes and people need a helping hand. When this happens Symbiosis uses our local knowledge to provide simple and effective relief for those who are worst affected. 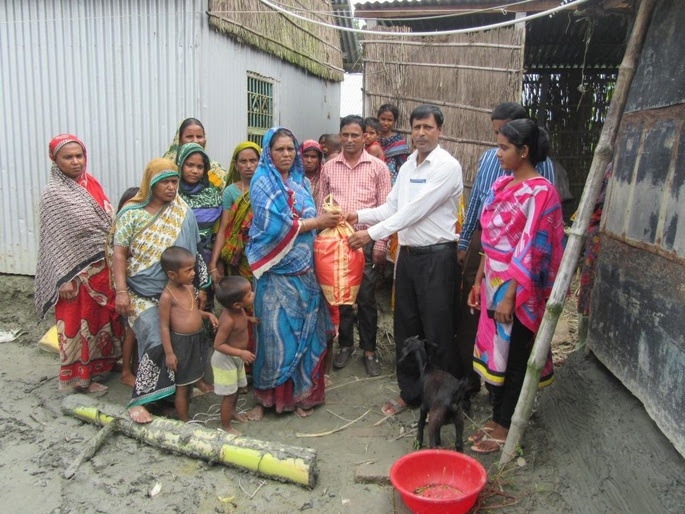 For example, our current Flood Relief in Bangladesh campaign aims to provide a $25 flood-relief kit (consisting of essential food and medical items) to 500 families. The recent flood crisis in South Asia is far from over. Some reports are suggesting that the flooding may be the worst in 15 years and that two-thirds of Bangladesh is under water. Thanks to your generosity we now have enough funding to assist almost 400 families with flood-relief kits! The kits are already being distributed and with just four days to go in our campaign we'd love to hit our target of helping 500 families."